I have a couple of confessions to make. The first is that I have not been doing any sewing. At first I chalked it up to post-vacation doldrums and the psychological adjustments that usually accompany the return to reality. Anyways, I’ve done a tonne of thinking and tracing and mental sewing, but not much real sewing. I embellished the neckline of the swimsuit coverup. And started working on a small stumpwork box. I’m new to stumpwork, but have always been intrigued by it. 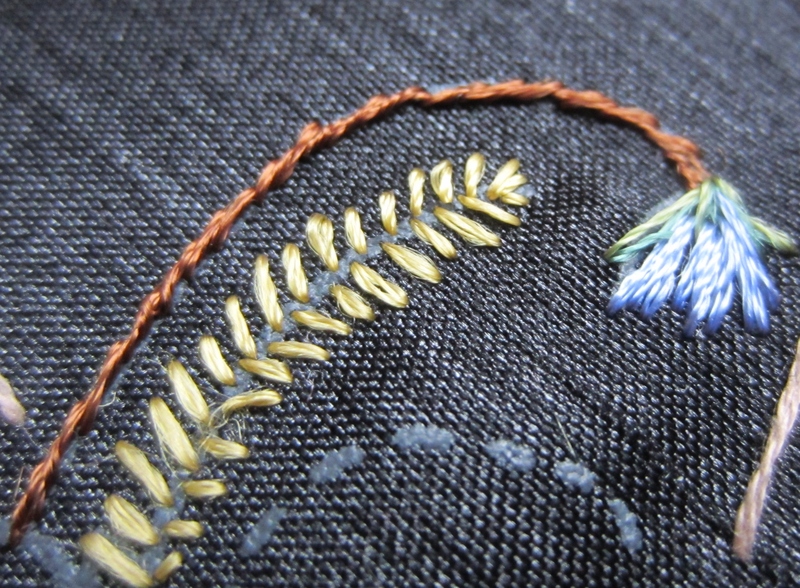 Here’s a fern leaf and a bluebell – fishbone and straight stitch. I’ll be working on bigger bluebell petals with wire later. Mental blogging! haha! I do some of that, too! Maybe it’s all part of the creative process…. There’s something soothing about sitting and hand stitching after a holiday, I think. Mental work can be done as fingers nimbly (or in my case not so much) do their thing. I love the bead work and embroidery. Gorgeous. And give yourself a break. You don’t have sew every second you have available you know! Your stump work is beautiful. have you seen any of Jane Nicholas’ stump work/embroidery books? They are wonderful eye candy (and helpful instructions, too). “faffing around” – yup! I spend countless hours that could be productive sewing hours faffing around! What a great word! These little touches that you are doing to ease back into actual sewing are sweet. Your embroidery is gorgeous. Mentally sewing. I like that term. I do it a lot.. I get frustrated by lack of finished garments. I have to remind myself that the thinking and tracing and deciding is all sewing. Oh, and ironing. Pesky ironing. 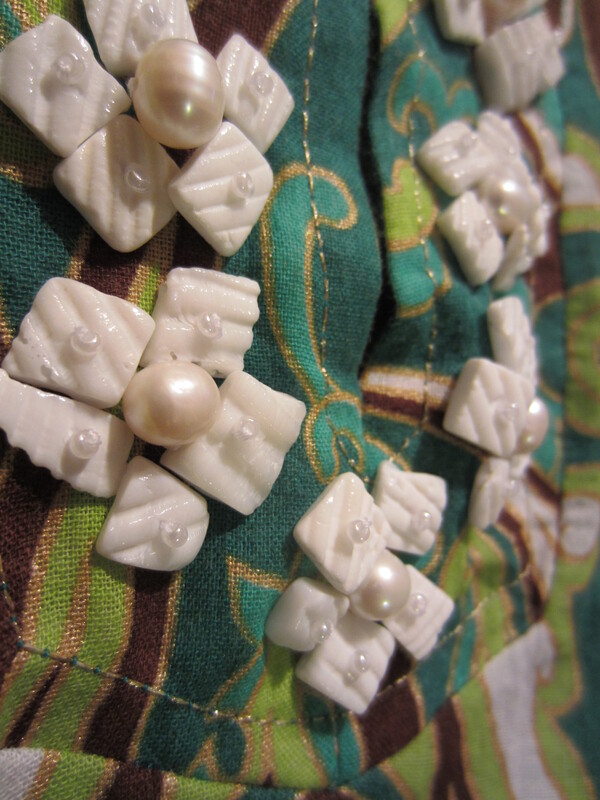 Beautiful embroidery and I think the embellishments on your swimsuit cover look like tasty candies. love it. I like your phrase “mental sewing” I do a lot of that too- what to sew next, browsing patterns, what ufo to work on and actually finish and so on. Echoing serahinalina comment: what is stumpwork? Yes, its the time of year! Spring is nearly here! Me neither! Stumpwork…I wonder if there would be a word for it in spanish! Don´t worry, Tia, your sewing “mojo” will come back soon! We all have those times when our sewing mojo is down, but it always comes back. I am curious about ‘stumpwork’ – I’ve never heard this term. Your stitches are pretty! I have never heard of stumpwork. How is it different from other needle work? Stumpwork is raised work or 3-dimensional embroidery where little items are made of thread, wire, stuffing, etc., and then incorporated into the embroidery design. It’s very interesting work, and I’ve always wanted to try it!